Charles Haynes returned as a speaker to Meher Center on November 10, 2007 after a long absence and was greeted with a standing ovation by what looked like over 100 people. The occasion for his talk was the 45th anniversary of the East-West Gathering, a meeting of Meher Baba with His Eastern and Western followers at Guru Prasad (house of the Maharani of Baroda) in Pune, India, in early November 1962. Charles first met Meher Baba as a boy in Myrtle Beach in 1958 and was 13 when he attended the East-West Gathering with his mother, Jane Barry Haynes, and sister Wendy and brother John. 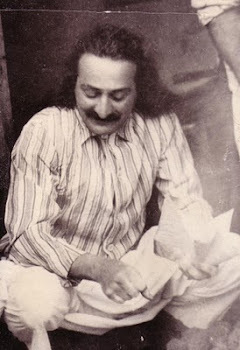 Charles said that he has no idea what work Meher Baba was doing at this Sahavas: “It falls under that wonderful heading, ‘Universal Work’” — the spiritual work Baba did to change consciousness of individuals and the world at large. The results unfold and need no explanation. Charles can only speak personally about what the East-West Gathering was like for him, because what else can you talk about but what you saw and felt, the stories that give hints of His fragrance, little clues to who he is as we try to pick up his scent in our minds and hearts? Every moment with Baba is a story that has some meaning for all time. As there are so many moments, Charles decided to focus on just four: the first glance, the last glimpse, and two moments in between. On October 31, 1962, 144 Westerners arrived in Pune. Baba saw the women and then the men separately. Charles vividly remembers the tremendous anxiety he had about the meeting with Baba. He was deeply concerned that “he wouldn’t be Baba.” It had been four years since Charles had first met Baba in Myrtle Beach at age 8. So much had happened since that time, and Charles felt he had come to know internally what he thought of as “my Baba.” He joked: “I’m sure your Baba is perfectly nice, but I had my own.” He felt he was closer to Baba; he wrote little poems and letters to him, and when walking through the woods he would speak to him. But now they were to meet Baba in the flesh. What if he was not the same one Charles had grown so close to? As each man arrived before Baba, Eruch was there to recall the person, where he was from, what orders Baba had given him — because although Baba was the All-Knowing One, like an ordinary human being he did not know such details in that way. He knew, but he didn’t know. It has been observed that this had the effect of making people feel comfortable and natural with Baba. When Eruch exclaimed, “Charles, Baba!” Baba gestured the sign made by forming a circle with his index finger and thumb. Every time he saw Charles thereafter, he did that. Then Baba exclaimed, “How you’ve grown!” Charles ran to embrace Baba. “I had the presence of mind to remember what I was going to do. I could not remember how he felt in 1958, so now I was going to remember how it feels. I put my cheek next to his and rubbed it very hard. Fortunately I’d not started shaving yet. Baba had a very close shave. I did the same on the other cheek. I can still feel that skin. . . . I may have missed a greater experience, but I’m so happy I did it.” Baba made a gesture that seemed to ask: What was that? Charles’s favorite moment that he often recalls was the only time he was ever alone with Baba. “I love the lengths he goes to orchestrate these things.” Charles had learned that the girls wanted to walk to Guru Prasad in the morning to be there early, and asked Mehera’s permission, because if she said they could come early, it would trump whatever Baba had said. So they wisely asked her. Charles was upset that they would get there before him, and he couldn’t ask Mehera, since males over 7 weren’t allowed to see her or speak with her, by Baba’s order. Normally Charles was reticent and introverted about a lot of things, but now he got the courage and was determined to find a way to go early. He never thought he’d end up asking Baba himself, but he knew Eruch was a softie, so during the darshan in the afternoon he rushed up to Eruch and blurted out that the girls had gotten permission to come early and he wanted to come early too. Eruch said, “I don’t know, you have to ask Him.” Eruch actually interrupted the Sahavas. Everyone was leaning forward, wondering what the big deal was about — the boy must be having a major crisis. Charles’s legs were rubbery. He blurted out his request and Eruch translated it into Gujarati. Baba was rubbing his chin and frowning. He looked up at Eruch as if the world were on his shoulders. What to do? Finally Baba said yes, you can go early, then opened his arms and gave Charles a hug — a bonus! Charles entered the room, empty except for Baba seated on the sofa. “I’d never seen him alone before — no garlands, no people, no mandali, no interpreter — all alone, looking at me.” It was a long room, and somehow Charles had to get from the door to Baba. He was very unsteady on his feet but put one foot in front of the other and finally reached him and said, “Good morning, Baba.” Baba looked at Charles, who couldn’t speak another word, nor could Baba speak, of course (since he was silent). “I’d never looked into Baba’s eyes before,” Charles said. “He didn’t give one the opportunity — his eyes were moving rapidly all the time. . . . I have no words for this, but the best I can say is, the feeling was that he is complete in himself and needs nothing. He is everything, and there is no separation between us. He is not his Discourses, the mandali, the Center, India . 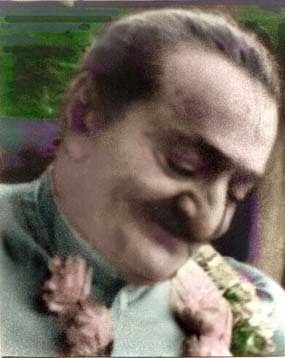 . . he is none of that, he is not even Meher Baba. It will be what we experience in our hearts — not what he says or looks like — that will give him away next time when he comes again. Only that recognition — ”It’s You!” — that’s what I felt in that moment. Elizabeth used to say that we all try to limit Baba, but no one can limit him. Charles doesn’t know how long he stayed — it seemed like forever. At some point Baba smiled and gestured, “Enough.” There was another hug, and the next thing Charles remembers is being out on the porch. So that was the first moment. It was the last morning and they would have to say goodbye to Baba. Purdom said out loud what many were feeling: that they’d never see him again physically. Charles was feeling that he would like to touch Baba’s feet — he’d had this feeling through the whole gathering. Charles thought there would be no opportunity, even though Easterners had done it (although Baba didn’t encourage this). He felt awkward and shy and didn’t want to be intrusive, even though he sat near Baba on the floor and could have done it. So that last day Charles was thinking about it. Baba said to Purdom: Why are you sad?, and Purdom said because it’s the last day. Baba didn’t like that. During the middle of the morning He took everyone outside because his brother Behram was going to take films. Eruch called, “Charles,” as we were about to go out. Charles didn’t look up, thinking he meant Charles Purdom. Then Eruch repeated, “Charles!” and he saw Eruch and Baba looking at him. “Charles, Baba says will you remove my sandals?” In that moment Charles knew for all time that Baba knows every heart — even though he asks: Where are you from? How did you sleep? Charles had to lift Baba’s feet and was very careful holding his foot, aware of his hip pain and wanting not to hurt him. He put the sandals aside (Baba had only put them on because he had gone outside). Then it was time to say farewell — a heart-wrenching moment. Many had held back, hoping to stretch the moment, but there’s nothing you can do to make it last longer; you can only take that last embrace. So Charles went up to receive his embrace. His mother, Jane, was very nervous and upset. Baba told her not to be anxious, and he said to all: I am the Christ. Open your eyes and you will see me as I really am. Then he sat back looking small and helpless. Baba gestured to Eruch, who said: “Charles, Baba wants to know where are his sandals?” Somehow they’d gotten pushed under the sofa. Charles found them and got them back on Baba’s feet. “I have no memory of how I did that!” Much later, what came to Charles about the sandals was what John the Baptist said of Jesus: I am not fit to unlace his sandals. Baba got up and made his way out of the room, looking very vulnerable; his suffering was very apparent to Charles. The white figure moved slowly through the crowd without any help, and Charles felt, Yes, he is the Christ. He comes and he breaks himself for us. So now he was gone from the room. They’d given up and accepted his final departure. Some people stayed to see the Tomb and other places — Baba arranged the excursion. Then word came to the hotel that Baba was leaving town and would be under the tree in the Bund Garden. He always sat under that tree before leaving Pune. So he said they could come see him there. This unexpected gift was pure joy. It seemed that when one had resigned oneself and accepted Baba’s will, then the reprieve would come. It was on November 10, 1962, that they had that final glimpse of his physical form. There was a large crowd, some 1,000 people. Baba was beaming happily. He had said there should be no questions. He asked Charles, “Where is your mother?” It was the first time in the week that Charles even thought about where she was. He replied, “I don’t know, Baba.” At that moment Baba found her in the crowd between Elizabeth and Kitty. He pointed to Jane, emphatically putting forth three fingers. When Baba got into the car, Charles wanted to get close to him one more time. Apparently everyone else had the same thought, so the car couldn’t move. Baba’s face was at the window, smiling at all. Just before the car broke through the crowd, Charles reached the window and said, “Goodbye, Baba.” Baba pointed at him and said, “Be happy.” “Not an easy thing,” Charles observed; “I’m still not able to do it. It’s one of the hardest things he asked of us, to be happy.” Baba made the circle with his thumb and forefinger, a gesture that was never interpreted. What Charles felt when he did it was tremendous acceptance, 100 percent. It was like a challenge to become perfect (that is, whole) in his love. You are called to be who you really are, which is who he is. I am that drop that has swallowed the whole ocean. If you were to really love me, maybe one day you will see me as I really am, Love me wholeheartedly and you might one day get a glimpse of my Reality. Thank you for Charles' story. It was great to read.